20th: It’s Easy Being Green – Look after the environment, or just eat green veg – go green today! Green is probably the colour that I eat the most of. I always try and have something green with whatever I eat. Lots and lots of greens. And what is greener than a green smoothie? 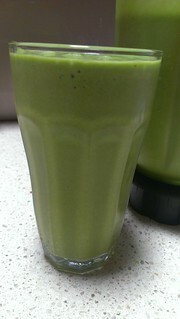 A green smoothie from the cookbook Greenilicious, written by my friend Leigh Drew. So prepare yourself, my friends, for many photos of green smoothies. While they may all look similar, you will be impressed by the variety of flavours she has created! Note, these recipes say that make 2 large or 4 small smoothies, but they really make one Susan-sized smoothie! 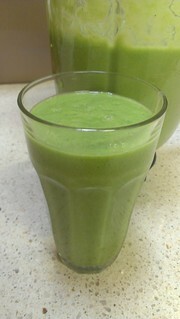 Mango Ice-Cream Green Smoothie: This smoothie is super yummy and super creamy, but not too rich. So you can just keep drinking and drinking. Mangos, bananas and cashews bring the creamy, and the greens are courtesy of bok choy and baby spinach. If you love mango, you will be into this! Vanilla Poached Pear Green Smoothie: Sometimes I find pear smoothies to have a bit of a funny texture, but this one is lovely and smooth. And also lovely and sweet! The greens are bok choy and cucumber, which makes for a refreshing base! Orange Melting Moment Green Smoothie: This is sweet and creamy thanks to cashews and dates. The greens are celery and baby spinach. I often am not a fan of orange juice based smoothies, but Leigh has managed to make this smooth and sweet and rich. 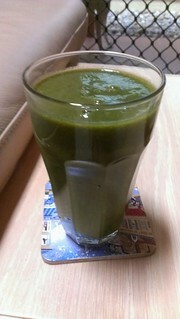 Gingersnap Biscuit Green Smoothie: This is a rich smoothie, thanks to the base of macadamias. 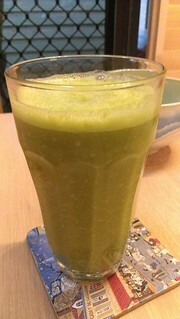 It has an intriguing mix of box choy, broccoli, bananas and strawberries, as well as a hefty dose of ginger. It all comes together to make quite a lovely drink. I might make this again for my Christmas morning post-bikram yoga breakfast this year! 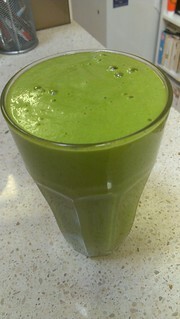 Carrot Cake Green Smoothie: Who would think that cauliflower in a smoothie would result in such a delicious result? But this carrot cake smoothie is divine. The flavour is spot on for a carrot cake, and it is also not too sweet (a plus in my books). 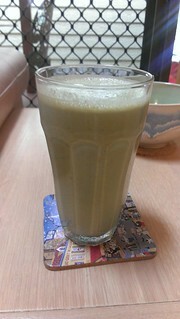 Anne's Peach Melba Green Smoothie: Hello delicious! Peaches and raspberries meet OJ and cos lettuce (aka romaine for my US friends) for a wonderful green drink! Turkish Delight Green Smoothie: Mango, banana, dates, cos and spinach form the base of this smoothie, which owes its name to the added rosewater. This is amazing in flavour, but is quite strong to drink all at once. But thankfully it keeps really really well! 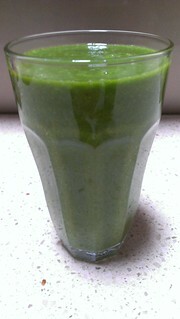 Leigh has many more delicious green smoothie recipes in the book. You can read about some of them here, in other Greenilicious posts I've blogged. Including my favourite smoothie of all time anywhere ever, her Strawberry Shortcake Green Smoothie. I gave it three ':D' ratings! And there are even more in the book that I haven't blogged yet (but I've made them and they are pretty great). 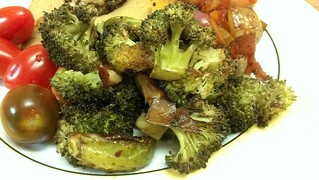 Roasted Balsamic Brussels Sprouts and Broccoli: For making it through all those green smoothie photos, here is a photo of some other green food! The book has a lot more to offer than just green smoothies! This dish comes together super quickly, and is very tasty. What would your dream green smoothie flavour be? 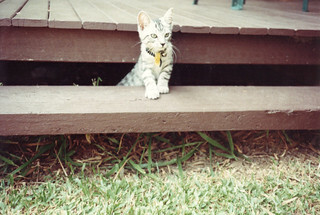 Under the deck was a very popular place for kittens! While that deck has been turned into a sunroom now (I am typing this blog post from there! ), for the kitties that had access to it, it was lots of stalking fun. Plus we got to see how cute they looked emerging on the steps! This is my fourth kitty Pascall, having her fun. All your smoothies look so tasty! I am... green with envy... Sorry. I'll go away now. I love your joke, I applaud your joke! It was such a fun book to test for!